I provide individual, couple and family therapy for Trans youth and adults. As a Gender therapist, I have specialized training and experience in working with individuals who identify as Transgender, gender fluid, gender non-conforming, genderqueer, nonbinary, agender, bigender, intersex and more. It is my passion to provide you with a safe and affirming space to explore, encourage and inspire you to be YOU! Gender therapy offers you a safe and affirming space to explore issues related to your gender with a therapist who has specialized training and experience in gender identity issues. A gender therapist has specialized training and experience to assist you in exploring your gender identity. They can assist you in better understanding your gender journey and how to navigate emotional, social, medical, relational, academic and occupational issues that may arise related to your gender identity. What is an LGBTQ-affirming therapist? An LGBTQ-affirming therapist is a therapist who is affirming toward the LGBTQ community. However, they may or may not have had specialized training in Gender therapy to best assist you in your transition process. Often times, clients that come to see me have already been working with another therapist, yet as they uncover and explore their gender, they want a gender therapist who can better assist them with their transition process and access to resources in the community. If you or your child are questioning, exploring or affirmed in your gender identity, I would be honored to assist you in any way I can. What can I expect from gender therapy? A gender therapist will help guide you through your gender identity process. It is a safe space to be you and share your gender journey. Do I need to see a gender therapist to medically transition? It depends. Some physicians require a letter from a therapist before they will prescribe hormones or perform any surgeries, while some physicians believe in the “informed consent model”. Informed consent means that after appropriate education and advisement about the treatment in question, the ultimate decision regarding treatment choices rests with the patient and/or parent if the patient is a minor. With informed consent, a letter from a therapist is not needed. You make your own health choice decisions. If you are seeking insurance coverage for surgery, most insurance panels do require a letter(s) from a therapist and/or a physician recommending that the surgical procedure is necessary for your well-being. If you are uncertain if a physician in your area follows the informed consent model of treatment, ask the office staff if a letter is needed for the medical procedure which you are seeking consultation about. I believe in the informed consent model and therefore, individuals seeking my therapeutic services are not required lengthy treatment with me before I will provide a letter of support for medical interventions you are seeking with a physician. In our sessions, we will explore your gender journey, discuss the pros and cons of the medical interventions you seek, make any appropriate referrals to physicians and resources and, if needed, provide you with a letter of support for your medical transition steps. When do I know if I need to see a gender therapist? If you are questioning, exploring or affirmed in your gender identity and want a specialist to help guide you toward resources and your true expression of yourself, a gender therapist can assist you. Parents may also seek guidance from a gender therapist in order to better understand their child, connect with other parents and address their concerns and questions. 1. What does it mean to be transgender, gender expansive, non-binary, gender fluid or any other identity that my child is identifying as? 2. Are my child’s friends and social media influencing my child’s identity? 3. When are the steps and the best time to begin social and/or medical transitioning? 4. How do I find a doctor that understands and works with transgender and gender expansive youth? 5. What are the effects of hormones and are they safe for my child? 6. Where can my family get support? 7. How do I tell friends and family members? 8. How do I advocate for my child at school? 9. How do I protect my child from potential bullying at school and online? 10. I do not understand this, agree with this or my religious beliefs do not align with my child’s gender identity or sexual orientation. 11. How can I reconcile my faith and my child’s identity? 12. I support my child, but my partner or my child’s other parent does not. 13. 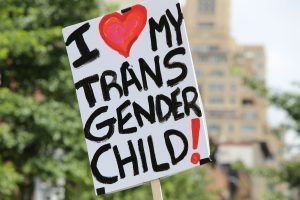 Can you change or influence my child’s gender identity or sexual orientation? 14. How do I legally change my child’s name and gender markers? 15. My child is depressed, anxious and/or dysphoric. How do I help them? 16. Why does my child focus on their gender so much? Why is it such a big deal? You may also find some answers to your questions on my Trans Resources page. Accessing the right resources is very important to assist you on your journey!